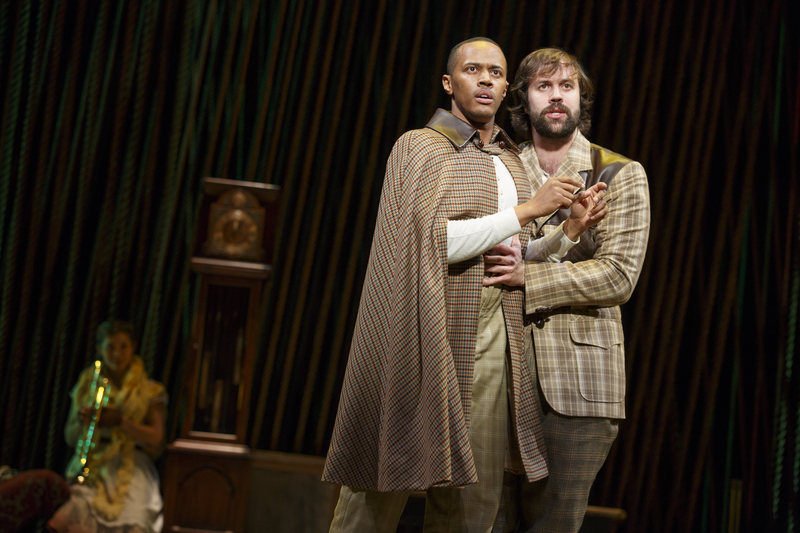 Anthony Chatmon II as Cinderella’s Prince and Darick Pead as Rapunzel’s Prince in Into The Woods. Photo by Joan Marcus. 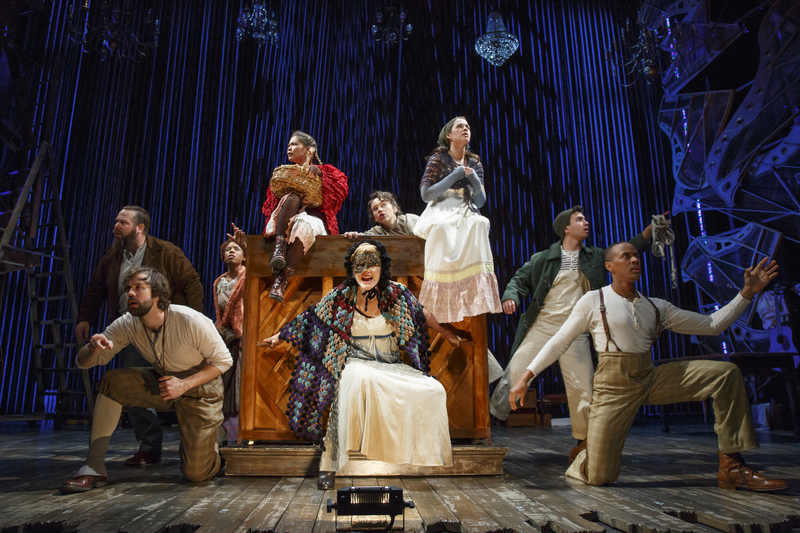 Lapine and Sondheim’s theatrical classic, “Into the Woods” opening this past Sunday, February 19th, at The Peabody Opera House, did NOT disappoint. Minimalist decorum would be a great way to describe the set on Sunday. The set was adorned with ropes which created the look of walking through the wilderness. Stage right stood an unusual sculpture that looked like the bodies of grand pianos, but wooden. 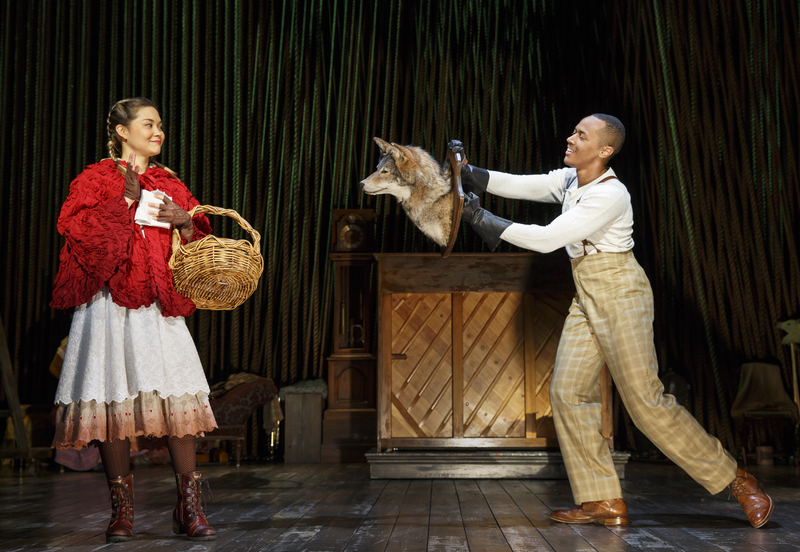 Lisa Helmi Johanson as Little Red Ridinghood and Anthony Chatmon II as The Wolf in Into The Woods. Photo by Joan Marcus. Stage left – a tower made from wooden ladders that also created a cabin shape, spinning on casters. The other part of the show that grabbed my attention was the fact that this entire production was NOT orchestrated. The musical instruments were played by members of the company, and pianist Evan Rees. The piano was also on casters, spinning in and out of the story as a part of the story itself. In my opinion, this company was phenomenal. Six of the ten cast members playing multiple roles and musical instruments. For those of you who are not familiar with Sondheim’s “Into the Woods,” it’s a compilation of stories all happening at the same time. Cinderella trying to get to the prince’s banquet, Jack (with the beanstalks) trying to sell his best friend (a cow) named Milky White, Red (riding hood) trying to get to Granny’s and Rapunzel locked away in a tower all while this baker and his barren wife are trying desperately to reverse a curse put on their home by the witch in order to have a child. These characters must travel into the woods to carry out their objective. 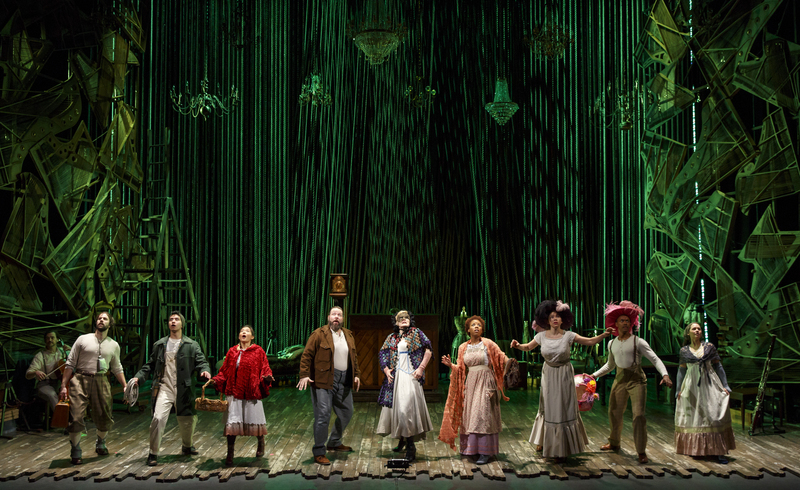 Into the Woods photo by Joan Marcus. The characters are chasing a proverbial carrot, all searching for their happily ever after. At the end of Act I it appears that they have worked together and managed to achieve that goal…but is it ever that simple? Act II shakes things up and tells what could be interpreted as the real story behind happily ever after; which is that life is never that simple. Sondheim and Lapine’s twist of fate for these characters cast a shadow on life’s happily ever after. If you’ve never seen this show, I highly recommend you do so. It’s fun with a deeper message. Darick Pead- Darick played Milky White (the cow), Florinda (Cinderella’s Wicked Stepsister), and Rapunzel’s Prince. I laughed hard enough I had to cover my mouth a few times. His depiction of Milky White was absolutely hysterical as was Florinda and Rapunzel’s Prince. This is an actor I will keep my eye on in the future. If I was someone who had absolutely no theatre experience, Darick would have carried this show for me. Anthony Chatmon II- Anthony played Lucinda (Cinderella’s Wicked Stepsister), the Wolf, and Cinderella’s Prince. His soulful voice as the wolf was amazing. He played all three roles well but the soul and animation I saw in the wolf was great. Eleasha Gamble- Eleasha played the bakers wife, desperate to have a child. Her ability to interact with all different characters and stories taking place in the woods made the overall story line very cohesive. I see big things for her. Stephanie Umoh– Stephanie played the wicked witch that stirred the entire story! Her role influencing everyone. The girl packs a punch!!! Her voice is phenomenal, her character evolving while staying extremely animated, is spot on. The girl was on point!